If your pup is suffering from loose stools, then you got to get the best dry dog food for loose stools to feed your pooch. The other day, my sister’s dogs got into the trash. Her labrador-collie wiggled her way past the trash lid and made sure to make a huge mess as she chowed down on the refuse from a week’s worth of waste. You can imagine how happy my sister was to come home to not only a huge mess, but also a very sick lab-collie. Our dogs are curious and they have very strong noses. This trait can get them into trouble from time to time, but there are also longer-lasting negative effects to dogs getting into things that they shouldn’t. Is Your Dog Suffer From Sensitive Stomach? What exactly does “sensitive stomach” mean in this context? Well, a dog’s stomach is very different from a human’s, but can suffer some of the same symptoms of intestinal upset that humans do. Dogs with sensitive stomachs are more likely to vomit, have loose stools or a lot of flatulence. This can be a temporary condition (such as when your dog eats something out of the trash that they shouldn’t) or can be a biological sensitivity that your dog is more likely to have. This can be based off of breed, age or even just the foods that you buy. Vomiting and diarrhea are the major signs of upset stomach, but can also mean that your dog may be suffering from a serious illness, not just getting into the trash. In these cases, you will definitely need to take Spot to the vet. Changing their diet won’t reverse symptoms caused by a disease. If your dog’s stomach problems are temporary, or turn out to stem from an allergy that your dog may have, changing up their diet is probably the best solution for them! This link will help you learn more about dog nutrition and proper dieting. Why Your Dog Might Be Suffering From Loose Stools? Loose stools are caused by a number of factors ranging from severe illnesses to simple digestive issues. Dog diarrhea is a common health condition characterized by abdominal pain and loose bowel movements. Although most cases of dog diarrhea are mild and easily treated with home remedies, others could be a sign of more severe problems. Common causes of dog diarrhea may include sudden diet changes, food allergies, or eating grass. It can be resolved quickly at home naturally. According to experts, loose stool may last for more than 48 hours and is accompanied by additional side effects suggesting a more severe problem, such as cancer or a parasitic infection. There are several reasons why your dog might be suffering from loose stools. Poor dietary habits are the root cause of diarrhea in dogs. If your dog has a hearty appetite, then it can be a worry as overeating of whatever they come across can cause gas, upset stomach, and diarrhea. Feeding too many commercial dogs treats, sweets or scraps also lead to unhealthy gut that results in diarrhea. A sudden change in the dog’s diet may also lead to diarrhea. A dog’s digestive system is different from a human. It will take a few days for a dog’s digestive system to adjust to a new type of food. For example, if your dog has eaten gravy food his whole life will have trouble when you present him dry food. Hence, if you are considering changing your dog’s diet, you must do it slowly with small changes so that it allows your dog to adjust to whatever you are feeding him. Dogs suffering from loose stools are generally the dogs who struggle with food intolerance. Such dogs experience uncomfortable symptoms like gas or diarrhea on a constant basis. However, this can be narrowed down to certain dog breeds like Schnauzers, Wheaten Terriers, and Irish Setters among others that have hypersensitivity to foods rich in dairy compounds, gluten, or fat. Allergies – sensitivity to certain foods can disrupt your dog’s digestive balance causing loose stools. Parasites – intestinal parasites like giardia, coccidia, hookworms, and roundworms can cause major digestive issues including loose stools. Toxic plants or poisonous substances – sudden diarrhea is a symptom of dog poisoning. Household products, poisonous plants, and lead-based products can cause gastrointestinal problems. Swallowing foreign objects – dogs, when left unattended, have the tendency to get into the garbage bin and eat something they aren’t supposed to. Anything they eat from the garbage can obstruct their bowel movements. Viral or bacterial infections – bacterial infection like salmonella, and viral infections like coronavirus, or parvovirus can cause muscle weakness, fatigue, loose stools, vomiting, and fever in dogs. Disease or illnesses – inflammatory bowel syndrome, tumor in the intestinal tracts, colitis, or cancer of the kidneys and liver can cause loose stools. What Can You Do To Firm Up Dog’s Loose Stool? Obviously, some of the causes mentioned require specific therapy, but some can be resolved with simple supportive care. However, you are always recommended to seek advice from your dog’s vet before practicing any of the methodologies you learned from the internet. When your dog is suffering from loose stools or mild diarrhea, firming up his stool will ease up his digestive distress while decreasing poop deposits. Here are several ways using which you can firm up your dog’s loose stool. Restricting your dog’s diet to a minimum when he is suffering from loose stool is a great way to firm up his stool. Feeding less relieves strain on your dog’s digestive tract. To do this, you need to remove your dog’s food for 12-24 hours. Next, feed him half of what he usually eats. By the end of the third day, you will start seeing the results. Moreover, if your dog is overweight, you can simply cut back on his food, and reduce his treats. You need to feed your dog foods that with help soothe his digestive tract. For example, you can feed your dog canned pure pumpkin as a healthy treat or a spoonful of cottage cheese (low-fat) or yogurt. The mentioned foods are high in calcium and can help the dog’s stool. Moreover, these foods contain dietary fiber that helps absorb moisture and firm stool. However, if your dog doesn’t like dairy food or is sensitive to such products, another alternative is to feed him rice cooked in chicken broth. But before giving any of the meals mentioned, you should first check it with the vet so that he/she can rule out any potential harm that your dog may be under. When your dog is suffering from digestive problems, it is advised that you feed him food that’s bland. It allows the digestive tract to soothe up. Chicken and rice meal is a nice bland food option. You have to simply boil brown or white rice until it gets tender and sticky. Next, mix it up with boneless, skinless canned or stewed chicken. It tastes good and is healthy as well. It will help your dog regain his lost energy while firming up the stool. If the condition is still not improving, you might want to try different dog food. Before you select any of the dog food, show the ingredients of the current dog food to the vet. The vet may be able to suggest foods with certain ingredients present or absent according to your dog’s condition. Select dog food products with low fat as it will benefit from better dog health and firmer stool. Make sure that you only choose foods that are prescribed by the vet to ensure safety and excellent results. How To Help Your Dog Get Rid Of Loose Stools? Diarrhea and loose stools are common canine afflictions and vary in intensity, duration, and frequency from dog to dog. Well, you may not be able to prevent dog diarrhea, there are ways using which you can help your dog get rid of loose stools. Food allergy is not a common condition in dogs; however, there are instances when the dog’s immune system misidentifies a protein from food as an intruder instead of a food item. Hence, you need to check your dog’s daily diet for allergens. It can be anything from beef, chicken, lamb, eggs, dairy products, etc. As mentioned earlier, you need to cut back on your dog’s usual ration to half to ensure that his digestive tract isn’t getting much worked out. This will help soothe the digestive system, and your dog’s stool will eventually turn up firmer. You need to provide tasteless, plain food to your dog when he is suffering from digestive distress. Foods low in salt, sugar, and other components will benefit from soothing the digestive tract. Most of the grain products boast ingredients from unknown sources and nutritional quality. They are also known to contain artificial sweeteners, chemical residue, and other additives that can make the condition worse for your dog. Low electrolytes and dehydration can become a serious issue in dogs, especially when they are suffering from diarrhea. It is essential to keep your dog hydrated. There are plenty of electrolyte supplements available for dogs, but as said, early, never use them without the vet’s prescription. Feeding dry dog food could help your dog get back into health. Dry food is rich in fiber content and can help absorb moisture, making the stools firm. Eating trash and stale food could worsen your dog’s condition. You need to make sure that he is not eyeing around the garbage bin. Ensure that all the trash is thrown out of the house. You need to consult a vet if things aren’t improving. A vet may be able to help you with your dog’s condition. There are a lot of things to consider when picking the best dry dog food for loose stools. In most cases, the carbohydrate level in dog foods is higher. Carbs are easy to digest given your dog gets his much-needed exercise. However, when your dog is suffering from diarrhea, you need to give him foods that rich in carbohydrates, but that can be easily digested. High protein content will help soothe the digestive tract of your dog, resulting in firm stools. Healthy fats including omega-3 and linoleic acid can help your dog pass firm stool. Make sure that the healthy fat content is in abundance in the dry food you choose. Vitamins and minerals are essential for the gut health of your dog. It helps fight bacterial and viral infections while keeping the digestive tract intact. The dry dog food you buy should contain a balanced ratio of macro nutrients that aid to your dog’s digestive system. Consider the product with the vet before giving it your dog. 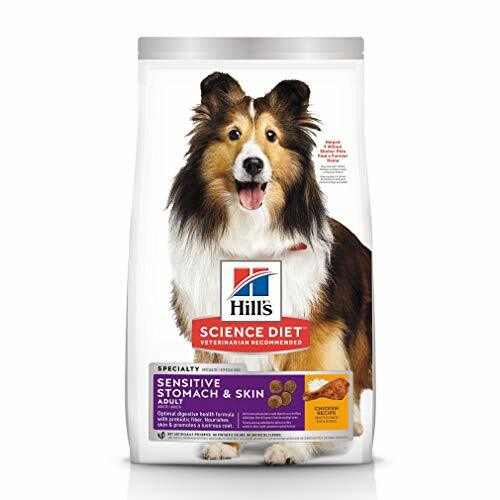 Hill’s Science Diet dog food advertises itself as the perfect formula for adult dogs with stomach sensitivities. It includes many of the necessary vitamins that dogs need, along with Omega-6 fatty acids. It also boasts its ability to help dogs with allergies and skin sensitivities. However, it is missing the crucial addition of Omega-3 fatty acids, which come from fish oils. It also lacks a lot of necessary and important ingredients, and then tags on a high price tag. It is because of this, and its high price range, that Hill’s Science Diet dog food ranks a little lower on the list than its counterparts. 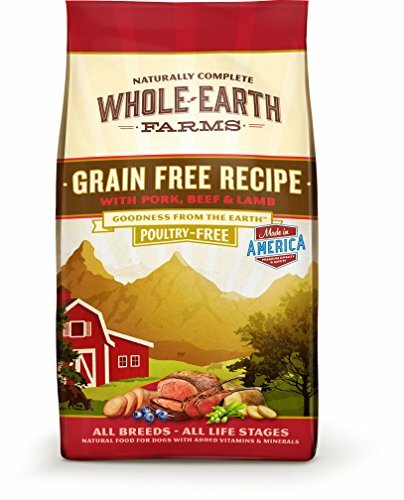 Whole Earth Farms dog food has the advantage of being one of the cheaper dog foods on this list and is locally based in the United States. This dog food is prevents shedding, promotes healthier skin and is poultry-free for dogs with extra sensitivity to poultry-based products. This is also a good indicator that it does not contain by-products of poultry. However, because it is lacking in poultry, Whole Earth Farms has a much higher amount of beef and lamb. While this may be good for a sensitive stomach and prevent an allergy, lamb and beef diets tend to be fatter and cause weight gain. Furthermore, the lack of ingredients listed as this product is advertised makes it difficult to decide just how healthy this possible food alternative is. Purina Pro Plan hits all the boxes! Not only does it focus its vitamins and minerals on both Omega-6 and Omega-3 fatty acids, but it derives its nutrients from healthy oils such as fish and sunflower. The extensive information on the label as well as nutritional guidelines for your dog only show the care and devotion that Purina puts into its products. Even though this particular product has a higher range of price, the overall ingredient list and benefits that this formula provide outweigh a heftier sum. It is still not the most expensive dog food on this list, and it checks all the boxes perfectly! You’ll be pleasantly surprised with this one. 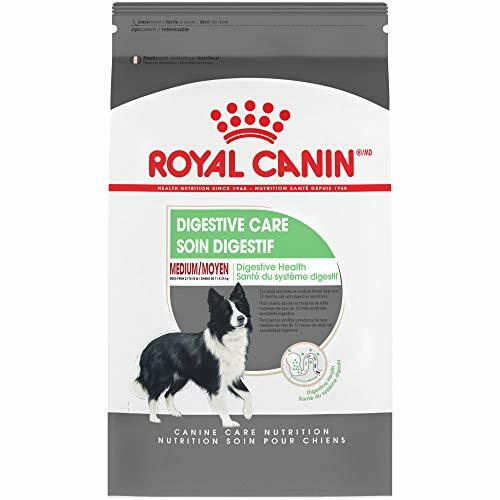 Royal Canin dog food is full of great information on how to help your dog and its sensitive stomach. This dog food boasts a formula perfectly made for any dog that may be struggling with allergies or digestive issues. It comes with a lot of the vitamins we’re looking for as well as an informational chart on feeding and how much you should be giving to your dog. However, even though this food advertises that it is healthy and well-balanced, it also comes with cornmeal and chicken by-product. Although many foods have this feature, as a food designed to keep your dog from having negative reactions to its food, this is a potential issue. Also, this dog food is much more expensive than most for a 30 lb bag, especially for one that includes cornmeal. 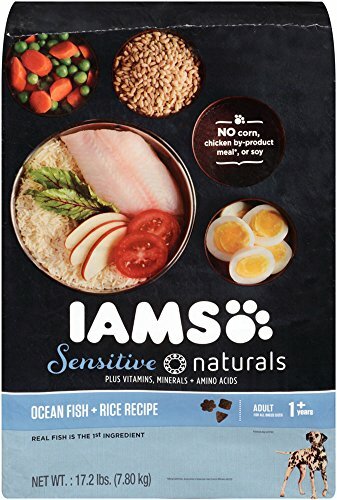 Iams Sensitive Naturals is chock full of great ingredients, feeding guides and nutritional information. It advertises soft coats, shiny fur and easy digestion on a sensitive stomach. Not only that, but this wholesome dog food includes mostly fish-based eating, which will keep your dog feeling healthy and trim. This particular dog food checks all the boxes and adds a little more to your dog’s diet, such as healthy oils and grains. The biggest drawback to Iams Sensitive Naturals is the price tag. While Purina Pro was at a mid-high range of price for all it offered, Iams is definitely on the highest end of the spectrum. For some dog owners, this may be worth it, but because we’re looking for accessible, and helpful dry food alternatives, this price tag puts its second on our list. For this particular blogger, for me the best choice is Purina Pro Plan FOCUS Sensitive Skin & Stomach Adult Dry Dog Food. 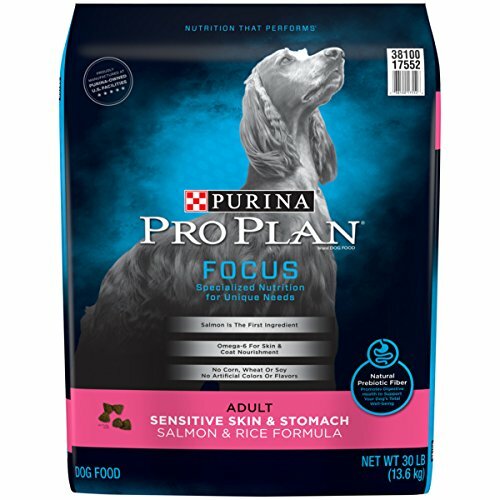 Even though a lot of the contenders on this list would be great for any situation, Purina Pro hits all the boxes and is within an affordable range for a 30 lb bag of food. While Iams Sensitive Naturals claims nearly the same benefits and ingredients overall, the high price tag will put of any owner of a large dog or more than one dog who requires this dietary supplement. It is for this reason that Purina Pro Plan dog food pulls ahead on this list. Not only does it contain the necessary vitamins, minerals and fatty acids, the overall attention to your dog’s sensitive stomach issues is much more focused than the other brands. You’ll sleep easy knowing that your dog’s health is at the forefront of this product’s agenda!